Daily Distractions: Who will be the Dodgers’ backup catcher when A.J. Ellis returns from the disabled list? A.J. Ellis will play his second rehab game for Triple-A Albuquerque in as many days today. It could be his last. Tuesday is smack-dab in the middle of the 4 to 6 week timetable the team gave at the time of the arthroscopic procedure on Ellis’ left knee, so it would make perfect sense for him to rejoin the Dodgers then. Without Ellis, the catching duties have been split fairly liberally among Miguel Olivo, Drew Butera and Tim Federowicz, who’s currently in Triple-A. Which of the three becomes the backup once Ellis returns? Mattingly said the conversations have already begun. When imagining where the conversation begins, it’s tempting to focus on offense. There isn’t much to look at there. Olivo started hot, but in his last 11 at-bats he has no hits and eight strikeouts. Overall he is 5 for 23 (.217). Butera is 10 for 44 (.227) with two home runs. Federowicz was 5 for 46 (.109) with one home run before his demotion. Of course, the Dodgers aren’t focusing on offense from their catchers. More important to the conversation is how each player handles the position defensively and how well they work with the pitching staff. Those are harder to quantify, especially in a small sample size. Butera has the lowest catchers’ ERA of the bunch (2.90, 10th in baseball) and hasn’t made an error. He’s also tied for the league lead in passed balls (four) and has thrown out only one of four attempted base stealers. Of course, passed balls are a judgment call. 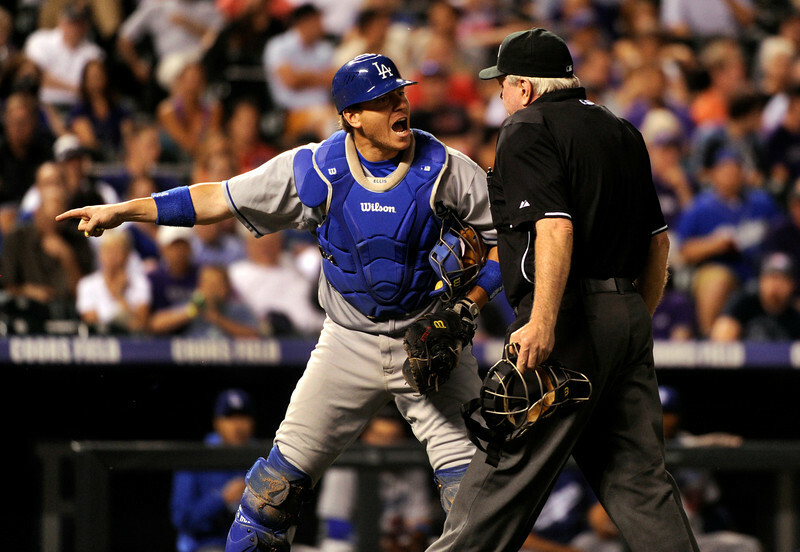 Olivo wasn’t charged with a passed ball last night when J.P. Howell threw a slider in the dirt in the 10th inning. But because Olivo didn’t keep the ball in front him, a runner was able to score from third base. In 54 innings, Olivo has a 4.73 catchers’ ERA. Two baserunners have tried stealing on him; one was caught. Pitch framing is not an asset for any of the Dodgers’ catchers, according to StatCorner.com. We could parse Federowicz’s numbers, but his contract status separates him from this discussion if Olivo, Butera and Ellis are healthy. Federowicz can be optioned to the minors at any time. He’ll stay there so long as he continues to miss 48 percent of the breaking pitches he swings at. (That was his miss rate in the majors.) Butera and Olivo are out of options, so one of the two will probably be designated for assignment in the next 48 hours. • The Mariners signed Mike MacDougal, whose last big-league appearance was with the Dodgers in 2012. • The hardest throwing prospect of the amateur draft era will be available next month. • Richard Cuicchi of TheTenthInning.com has uploaded for your convenience a list of all current major-league players who are related to someone else in baseball. • Happy birthday to Rafael Bournigal (48). This entry was posted in Daily Distractions, JP on the Dodgers and tagged A.J. Ellis, daily distractions, Drew Butera, Miguel Olivo, Mike MacDougal, music, Yasiel Puig by J.P. Hoornstra. Bookmark the permalink.